STREGA a company specialized in industrial communication with experience in the Automation, and SCADA which offer solutions tested in real industrial environments to provide the a reliable product on the market. 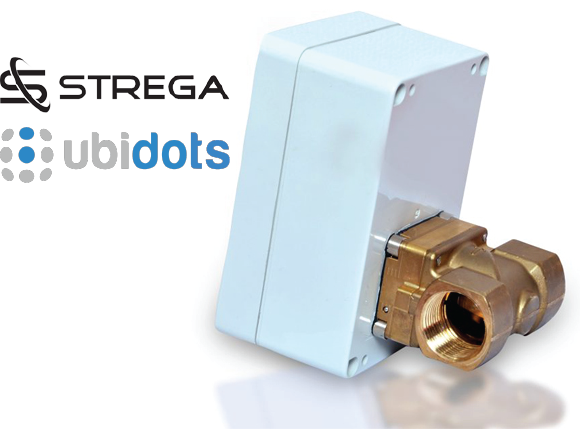 To learn how to connect a STREGA LoRa wireless smart valve & wireless time-controlled emitter to Ubidots through The Things Network, refer to this guide. 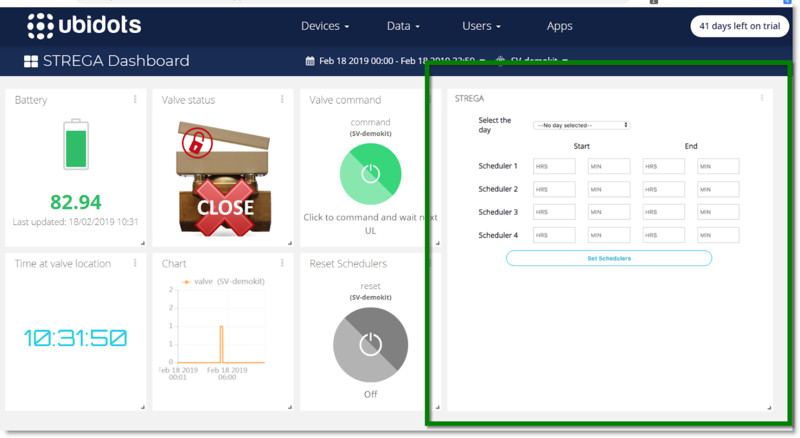 In order to program automatic operation of the STREGA schedulers through Ubidots dashboard, you have to implement some add-ons in your Ubidots account. Follow the steps below careful to ensure the proper operation. 2. Go to Devices page and select the device (SV/SE) for which you want to assign the Schedulers. 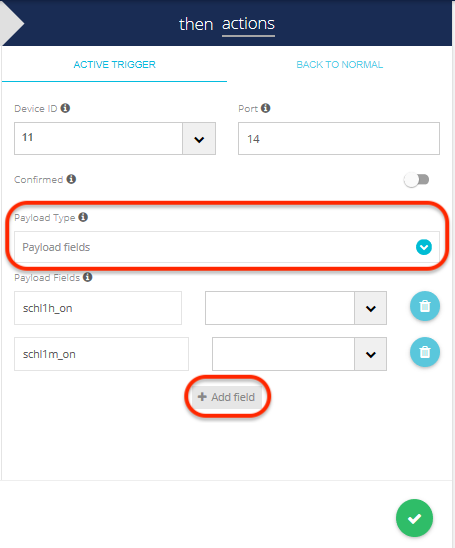 NOTE: If your STREGA device is already transmitting data to Ubidots, you will be able to visualize the device identified with its Serial number on the Device section. Otherwise, create a new device in your Ubidots account and assign its serial number as device label. 4. Assign a name to the variable – user defined (recommended to keep it as “scheduler” since we are creating it for scheduler operations). 5. Select the variable created, then copy the variable ID and keep for later. 1. Go to the Dashboard (Data > Dashboards) section of your Ubidots account. Once the code is properly placed, assign your Ubidots TOKEN, and the variable ID of the variable created (previously copied) where is indicated in the code below. 4. At this point, you'll be able to see the Schedulers widget created on your Dashboard. 1. Login to your TTN account – click on Application – select Integration. Column and Method as POST and click on save. 3. Go to "Payload Formats" section, and assign the following code as encoder of your application. Make sure to press "Save payload functions" to save the changes made. 1. 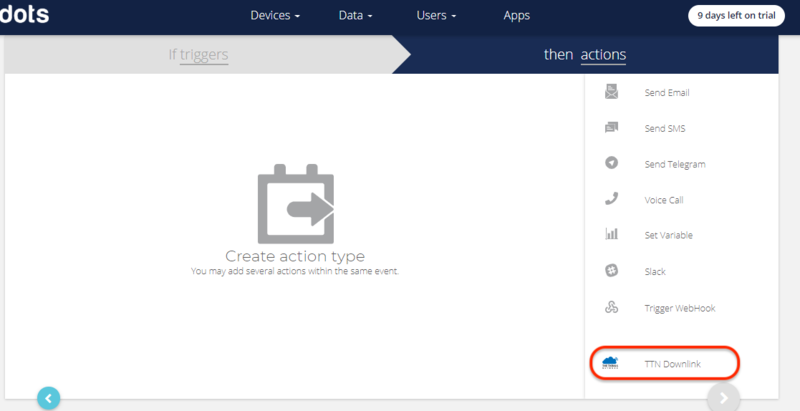 Go the "Event" (Data > Event) section, and create a new event just by pressing the plus (+) icon located at the right upper side of the page. 2. Create an Event using the variable which you have created for schedulers (this is the variable created for your scheduler in the device page). NOTE: 7 events must be created separately for reach day of the week since the port are different for every day in the STREGA schedulers mechanisms; so totally 7 events for 7 days. 3. Then click on the action – create a new action – select TTN Downlink. Fill the Application ID of your TTN account, Process ID (Name given when creating the Http Integration), Application Access Key (The access key which you have given while creating the Http Integration “Default Key” it can be found in the TTN account. TTN – Application - Overview). 3.2. Type the Device ID of your SV/SE, in the Port column type 14 for Sunday Schedule. 3.4. Then assign the value for each payload_field. Select the “Context” from the drop down for the field. Then double click on the context and edit is as context.schl1h_on . The same should be done for the remaining all the field variables. 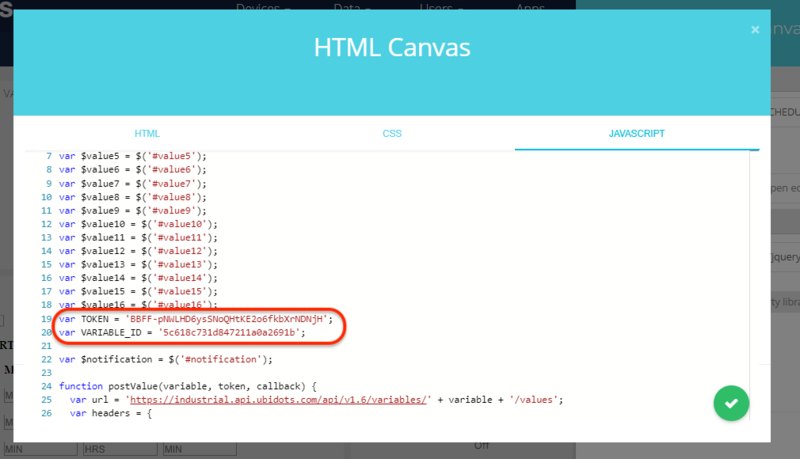 The content name should be same as the payload_field name. Refer the above point for the payload_field name. 4. To finish,click ok and name the schedulers respective to the day for easy identification. 5. Go to same event. Click on the event which you have created for the Scheduler. 5.1. Go to the action block and click on the “+” icon. 5.3. Select the variable of the Schedulers and set the value to zero. 5.4. To finish, press "ok". Now you're able to program automatic operation of the STEGA schedulers through Ubidots Dashboard in just a few minutes!